It’s true, Herman Cain did fall off after the 9-9-9 debate. He’d managed to bypass Mitt Romney to take a lead, but then three straight polls took his lead away after that debate, when a number of candidates all piled on against Cain’s tax plan. 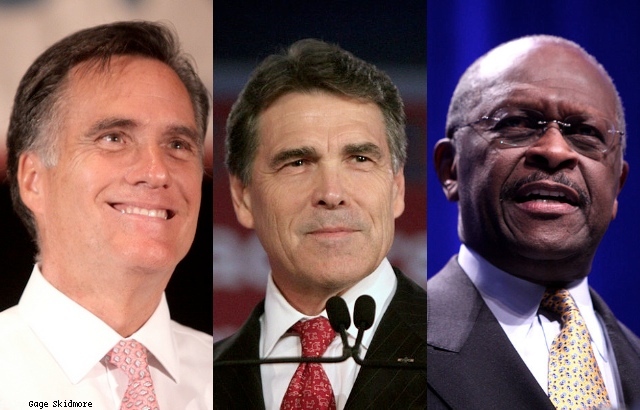 Well, we’ve since seen Mitt Romney get the pile on effect that Herman Cain and Rick Perry have previously endured, and now the effects are in: Herman Cain has passed Mitt Romney again, at least per the new CBS/New York Times poll. The facts: 455 Republican primary voters, mobile and landline phone handling. MoE 4. Rick Perry’s not moving in the right direction. He’s below the Pauldoza line at 6%. I only mention him because I may have to stop mentioning him if he doesn’t right the ship fast. All that will be left are Herman Cain, leading at 25% (up 8 since the last CBS poll), and Mitt Romney in second at 21% (up 4 since the last CBS poll). Perry in single digits for the second time in October, also the second time since entering the race. Cain leading for the first time in two weeks. Romney down from his post-9-9-9 debate highs, which put him in uncharted territory (above 25%). I think Romney was clearly hurt by the last debate, Perry wasn’t helped, and Cain is reaping the benefits of both. It’s the end of October. There may be two months left, but I don’t know how much time Perry has to keep this from being a two man race, with him on the outside. Cain’s not going away, nor is Romney. What about Newt? He’s gaining, and has to be part of the conversation. Newt and Cain are the Tea Party alternatives to Romney. There’s more time for Perry in this thing than you’d think. I was looking at the 2007-2008 GOP polling, and Huckabee didn’t even start to make his move until December. With the caucuses and primaries being at roughly the same time they were last time, two months is plenty of time to build a lead, or lose one. Herman Cain is crazy. from his comments on recent interviews about prolife stance where he flip flopped when being asked about what he beleived with regards to abortion for a woman who was raped to his most recent commercial which garnered attention but showed him to be nothing more than a joke. If hes the number one candidate for the repulican party they are not going to do well in the general election. I think Mitt romney is the most presentable of the bunch although he has made some seriouse miscalculations as well.